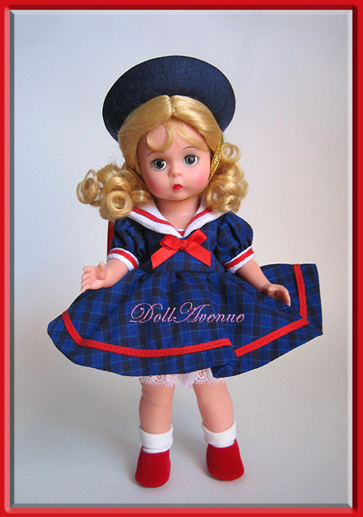 Ready for summer is this 8" Custom-dressed Madame Alexander Wendy doll we call "Yacht Club." Wendy has beautiful long blonde curls, blue eyes and rosy cheeks. She comes ready for an afternoon at the Yacht Club in an adorable blue plaid sailor dress lined in royal blue satin and accented with red piping around the hemline, red and white sailor collar and cuffs, and a cute red bow on her bodice. On her head she wears a smart navy blue felt hat with red ribbon and a gold chin strap. Under her dress, Wendy wears a fancy layered white lace slip, white lace ruffled bloomers, white socks, and red velvet slip-on shoes. A smartly dressed doll ready for an afternoon at the Yacht Club!